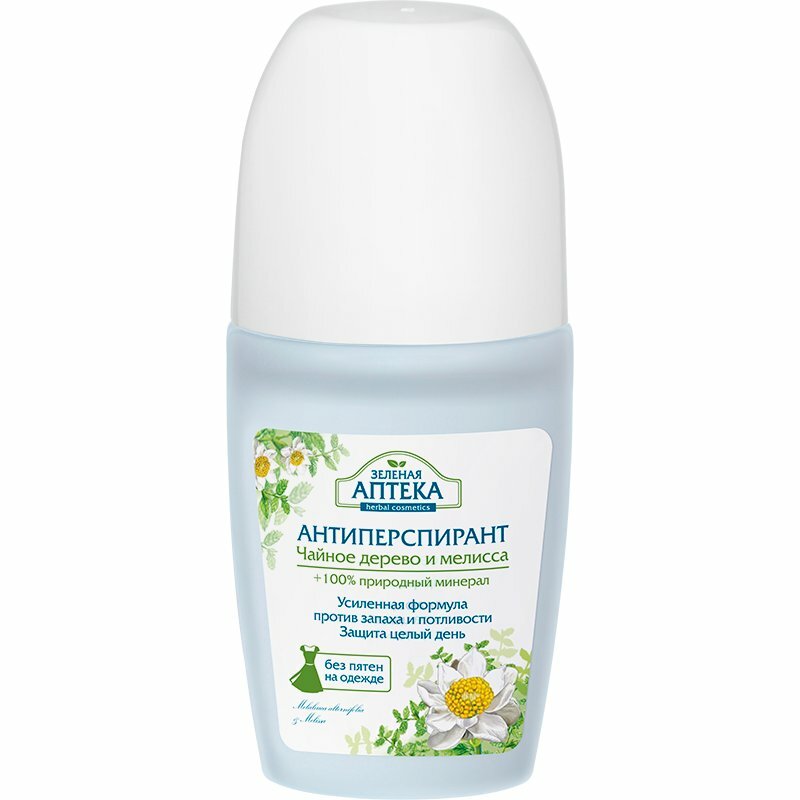 Ukrainian personal care brand Green Pharmacy presents Tea Tree & Lemon Balm Roll-on Antiperspirant. It has an extra-strong formula that keeps you fresh throughout the day and effectively prevents body odour. The product is formulated with tea tree leaf extract, lemon balm leaf extract, and potassium alum, a 100% natural mineral known for its antibacterial and astringent properties. The antiperspirant does not stain clothes and has a light, fresh smell. Tea tree extract contained in the antiperspirant has a strong antibacterial and anti-inflammatory effect. It has regenerative properties and speeds up the healing of cuts and other minor skin injuries. Lemon balm extract prevents flaky skin and hyperpigmentation, improves skin elasticity, and has a refreshing and rejuvenating effect. Potassium alum has pronounced antibacterial properties and a light astringent effect. It prevents body odour by eliminating odour-causing bacteria. Potassium alum doesn’t clog sweat gland ducts, it is completely safe for your health. Directions. Apply to dry, clean skin of your armpits. Do not apply to irritated or damaged skin. Use with caution in case of overly sensitive skin or individual sensitivity to particular ingredients. Ingredients. Aqua, Aluminum Chlorohydrate, Steareth-2, Ceteareth-12, Stearyl Alcohol, Cyclopentasiloxane, Ethylhexyl Stearate, Melaleuca Alternifolia Leaf Extract, Melissa Officinalis Leaf Extract, Potassium Alum, Ceteareth-20, Distearyl Ether, Dimethicone, Silica, Xanthan Gum, Disodium EDTA, Parfum, Propylene Glycol, Sodium Benzoate, Phenoxyethanol, Ethylhexylglycerin, Butylphenyl Methylpropional, Limonene, Linalool, Geraniol, Citronellol, Citral. Want to buy Tea Tree & Lemon Balm Roll-on Antiperspirant? Call us or submit your order via our web site! Cosmetics marketed under the trade name Green Pharmacy are produced by the group of companies Elfa, which is one of the largest producers of cosmetic products in Ukraine. Its products enjoy high popularity both in the domestic market and in neighbouring countries. The brand’s philosophy is based on 3 key principles. Time-proven traditions. Most recipes used for the production of Green Pharmacy products are based on the formulae developed by classical Soviet cosmetology school. Scientific approach. Green Pharmacy cosmetics are formulated with extracts and oils derived from medicinal plants growing in Ukraine’s climate zone, which have the strongest positive impact on the inhabitants of this area. Pharmaceutical standards. Green Pharmacy cosmetic products are manufactured at the company’s own pharmaceutical factory (Scientific Production Association Elfa). They meet all pharmaceutical quality requirements and are awarded special prizes and certificates.